Baton Rouge, La - Today, Monday, June 23rd, Deputy Secretary Krysta Harden announced a new resource: www.USDA.gov/newfarmers, a website that provides centralized, one-stop shopping for beginning farmers and ranchers to explore the variety of USDA initiatives designed to help them succeed. USDA's www.usda.gov/newfarmers has in depth information for new farmers and ranchers, including: how to increase access to land and capital; build new market opportunities; participate in conservation opportunities; selecting and using the right risk management tools; and, access USDA education and technical support programs. Cooperative Extension links are included among the Research, Technical Assistance, and Education resources. The website will also features instructive case studies about beginning farmers who have successfully utilized USDA resources to start or expand their business operations. 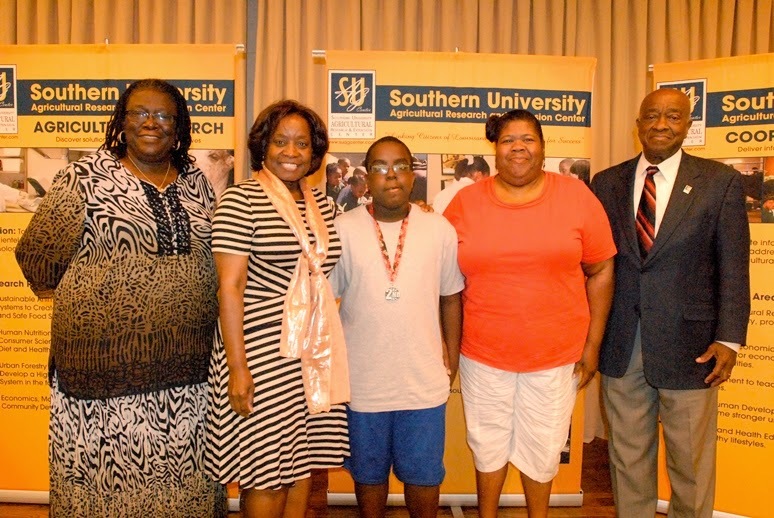 Baton Rouge, LA – The Southern University Agricultural Research and Extension Center concluded its 33rd Annual Youth and Family Exposition on Saturday, June 14 after three days of inspirational learning and fun activities. The event brought more than 300 youth from across the state to engage in contests, hands-on experiential learning, seminars and friendly interaction on campus. Sarah Sims, extension aide in Madison Parish brought the most (30) participants and took home three first place wins in public speaking. Miracle Styles, placed 1st in Public Speaking in the 9-12 Age Category; Kanessia Crothers won first place in the 13-15 Age Category; and Consuela Guice, came in first in the 9-12 Age Category in the Illustrated Talk contest. Other competitions and top winners included Public Speaking, Illustrated Talks and Quiz Bowl. In the 9-12 age group of Public Speaking, Miracle Styles from Madison Parish placed 1st, and Joseph Pickney, St. Landry Parish came in 2nd under the leadership of Extension agents Sarah Sims and Aubrey Williams respectively. Among the 13-15 age category contenders, Kanessia Crothers of Madison Parish placed 1st; Kataja Epting, East / West Carroll Parish took 2nd place; and Candace Noel of St. Martin Parish, was 3rd under the supervision of Sarah Sims, Carolyn Robinson and respectively. The Illustrated Talk competition consisted of three age groups. 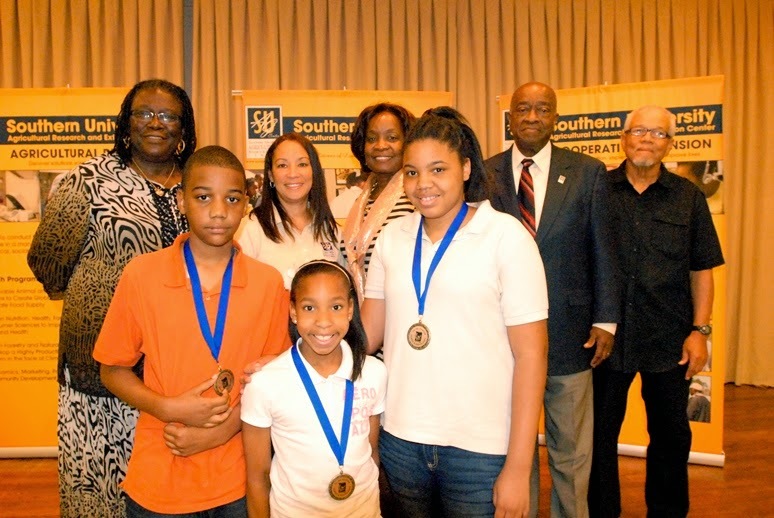 In the 9-12 Age Category; Consuela Guice, Madison Parish won 1st place; 2nd Place- Isaiah Bonner, Caddo Parish; and 3rd Place- Caylon & Taylon Celestine, St. Martin Parish. Extension agents Sarah Sims, Patricia Lee and Wilbert Harris brought the youth. 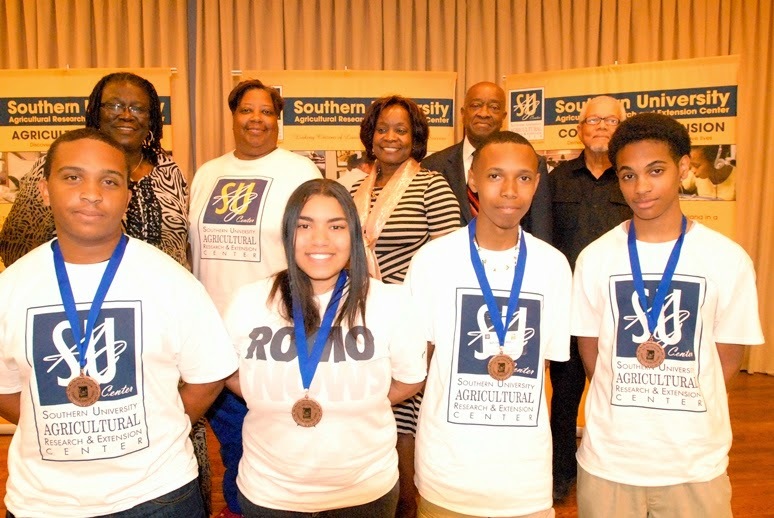 In the 13-15 Age Category: 1st Place- Chardai Burks & Taylor Threats of West Carroll Parish; 2nd Place – Quellique Serf of East Baton Rouge Parish; and 3rd Place – Seth Portiere & Greg Randle of St. Martin Parish; under the guidance of Carolyn Robinson, Terrence Marshall, and Wilbert Harris. In the 16 -18 Age Category, Grant Henry of Bossier Parish won 1st place. Mentored by Katherine Ervin, Henry has won Illustrated Talk four years in a row. The Quiz Bowl contests produced two winning teams. In the junior category, Calcasieu came in 1st, Caddo, 2nd and St. Landry 3rd. On the senior team, Bossier winners were 1st, East/West Carroll, 2nd and St. Landry 3rd. Extension agents in these areas are Carol Sensley, Carolyn Robinson and Ursula Ransburg. Concurrent breakout sessions included the secrets of soils; healthy youth, healthy future; discovering your niche in agriculture; urban greening and sustainability; turning gas into water: the art of science; tobacco-free zone: youth living healthier lives, and fun with numbers. Dr. Wanda Burke, Youth Development Specialist organizes this event and can be reached at 225-771-2242. 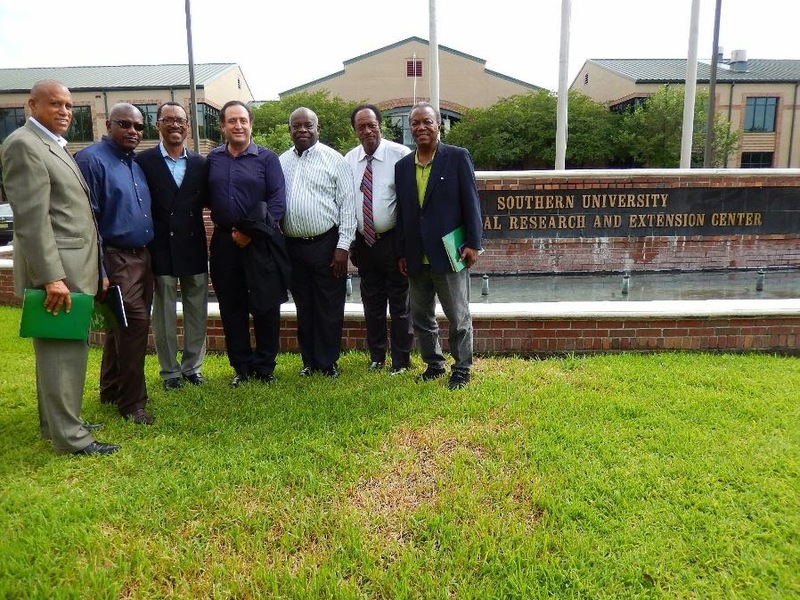 Baton Rouge, LA – The Southern University Agricultural Research and Extension Center continues to grow in scope beyond agriculture and Baton Rouge to the Southwest Center for Rural Initiative. This summer, youth in St. Landry Parish are learning about making biofuels from SU Ag Center staff. On June 17, 2014 the Daily World newspaper published an article entitled “From grease to green energy, kids learn science hands-on,” in which Mr. Antonio Harris, research associate and instructor, shows youth ways to turn grease into fuel from restaurant grease. The full article is available online at the Daily World website. 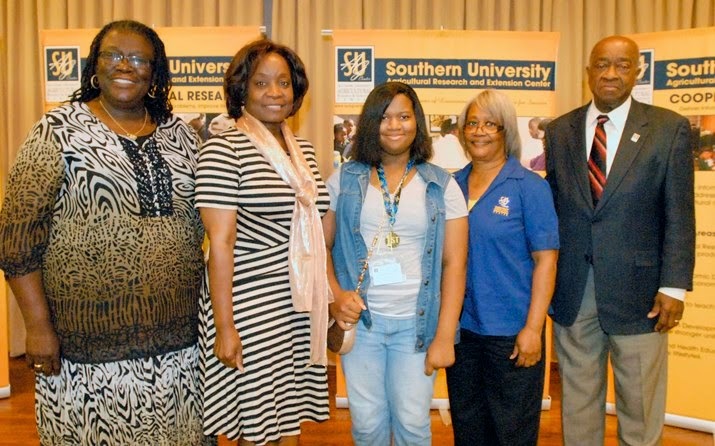 Baton Rouge, LA – Youth, families, volunteers and Southern University Agricultural Research and Extension Center faculty and staff gathered in A.O. Williams Hall on June 12 for an activity-filled weekend. Upon arrival, participants completed registration and kicked off the event with a friendly basketball game. This morning, in the midst of pouring rain, the youth rally ushered in the activities. Youth competitions in public speaking and illustrated talks are on-going as well as educational seminars and workshops. The event will culminate on tomorrow at noon with quiz bowl competitions, awards presentation and recognitions. Parishes across the state are represented from as far north as Morehouse and locally from East Baton Rouge. 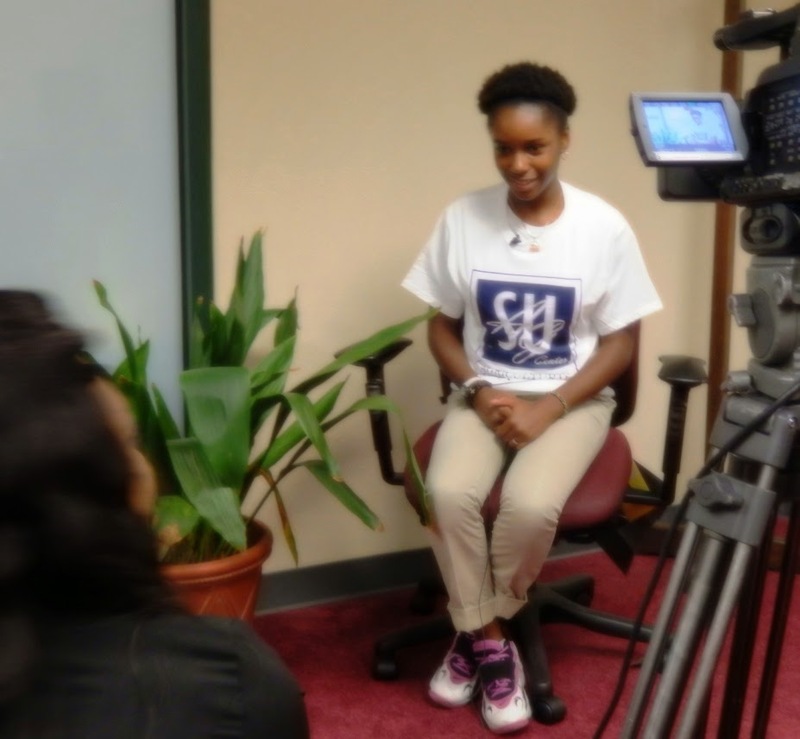 First time attendee, Garrinecia Singleton from Scotlandville Magnet High School expressed her excitement about the Expo. “I like science and astronomy; I want to learn more so as to decide what to study in college,” Singleton said. 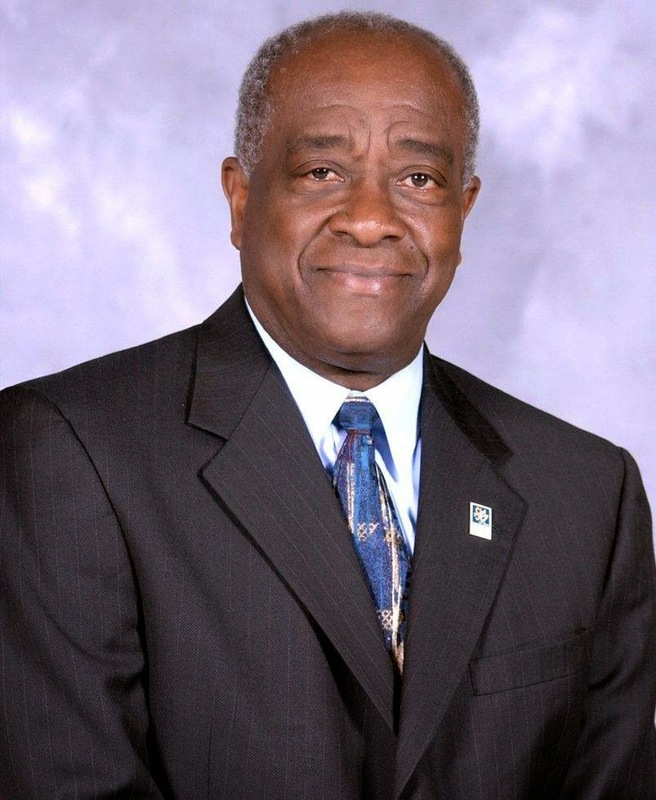 As the Cooperative Extension service celebrates 100 years, the LSU Agricultural Center is recognizing Leodrey Williams, who currently works at Southern University, previously at LSU and served at the national level in Washington, DC. Dr. Williams has been working for the Louisiana Cooperative Extension Service, for 50 years, half the time the Cooperative Extension has been in existence, according to a news release from the LSU Agricultural Center. In 1914, the passage of the Smith-Lever Act, created a partnership between agricultural colleges and the United States Department of Agriculture in efforts to support agricultural extension work. Extension work in Louisiana had only taken place through LSU until 1971 when Southern University created its own extension office. 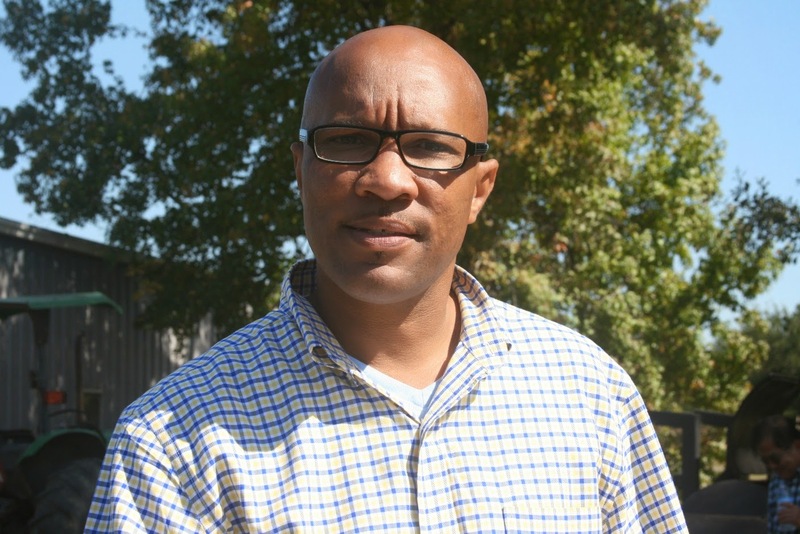 Williams was hired as an agriculture specialist, five years later, he went to LSU and served as associate state agent, director of Equal Employment Opportunity and associate professor in the Department of Extension and International Education, positions he held for four years. In 1980, he became extension director at Southern University. Soon after, Williams would move to Washington DC where he served as the national director of the Cooperative Extension Service, making him responsible for funding extension programs at 104 land-grant universities around the country. Williams returned to SU and took on his previous role as extension director in 1995. Then, in 2001 Williams was asked to head the newly-formed Southern University Agricultural Research and Extension Center. "No matter what you do, whether it's in community development, if it's in small business development, it's enhancing the socioeconomic quality of life for people," Williams said. "You have more people now than you had 100 years ago. As long as there are people with problems, there will be a need for extension service." For the past 50 years, Dr. Leodrey Williams has been working with SU and LSU in Baton Rouge, as well as Washington DC at the national level, in Cooperative Extension service. Baton Rouge, LA – The Southern University Agricultural Research and Extension Center continues to develop in the field of biomass and bioenergy. Dr. Kamran Abdollahi, research scientist and Urban Forestry Program Leader, is building a collaborative network to expand the reach of study in the field of bioenergy. On June 10, 2014 Abdollahi invited a team of experts to the SU Ag Center for discussions on ways to develop a strategy for enhancing the research in bioenergy production. The team consisted of five experts in diverse fields germane to bioenergy. Rubert Ward serves as President of JL Management Solutions LLC; Reginald Miles, Vice President, Phalanx Construction LLC; Martin Johnson, President, GreenSolar Louisiana; Morgan Watson, President, MEL Inc., and Glenn E. Ford, Chairman, GreenSolar Louisiana. As greenhouse gases produced by burning fossil fuels are contributing to the problem of global warming, studies are underway at Southern University Agricultural Research and Extension Center to discover various types of biomass that can be used to create fuel in more efficient ways. Biomass is the source of bioenergy. The collaboration between the SU Ag Center scientists and the industry experts will support development of a cutting edge product that will be environmentally safe and cost effective for future generations. On a global scope, bioenergy is the energy source of the future. One of the team members, Rubert Ward has more than 35 years of experience managing domestic and international operations, including extensive experience in the waste tire recycling and energy industries. As Plant Manager, he managed the successful start-up of a $400-million 565 Mw combined cycle facility and a $100-million 35 Mw biomass co-generation facility. Mr. Ward has also held senior executive positions with CMS Energy Corporation with investments and operations in 18 countries. He has had financial responsibility for $200 million of assets generation, including Jamaica Private Power Company (Kingston, Jamaica), eight hydroelectric plants and two wind power plants. 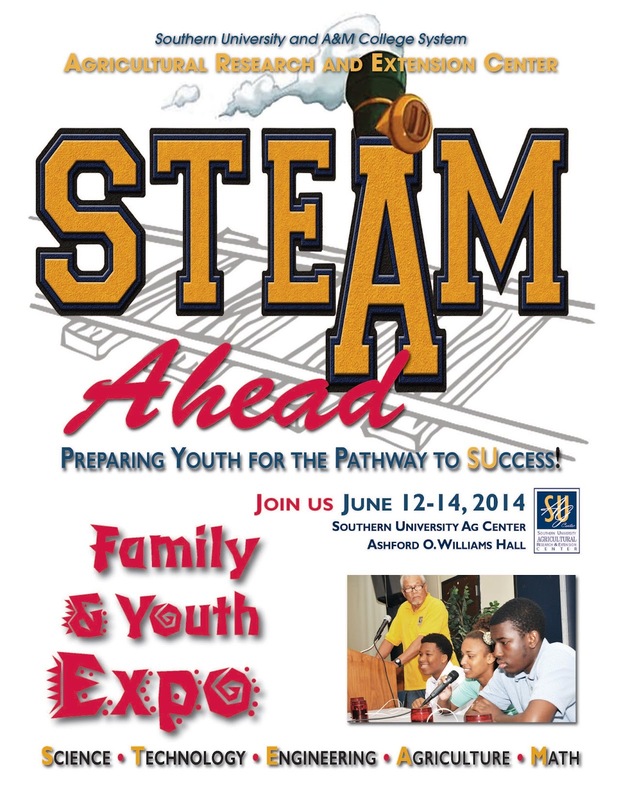 Baton Rouge, LA – The Southern University Agricultural Research and Extension Center will hold its annual Family and Youth Exposition from June 12-14, starting at 11:00 am. 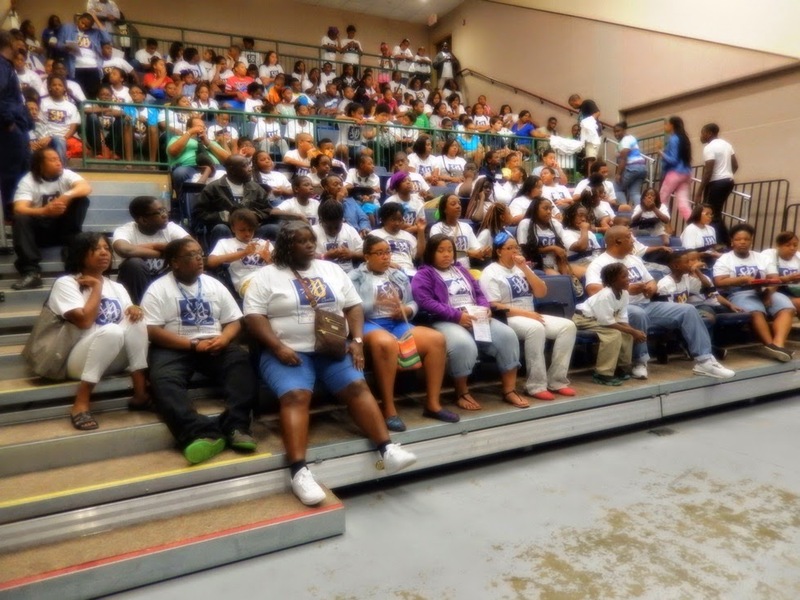 The event will assemble youth in Baton Rouge for a two-day educational, fun-filled experience. The 2014 event will also bring together, SU Ag Center specialists, agents, staff, faculty and volunteers from various parishes for a memorable program with the youth. Youth will arrive in Baton Rouge on Thursday, tomorrow, get acquainted and enjoy fun activities on the grounds of the Southern University Ag Center in A.O. Williams Hall. They will participate in educational seminars, workshops, illustrated talk, motivational and public speaking on Friday. The event will culminate on Saturday morning with quiz bowl competitions, awards presentation and recognitions. Baton Rouge, LA - USDA is focused on trying to address the challenge of persistent poverty rural areas. While poverty is a rural, suburban and urban challenge, the reality is that nearly 85 percent of America's persistent poverty counties are in rural areas. USDA's StrikeForce for Rural Growth and Opportunity Initiative is part of our commitment to growing economies, increasing investments and creating opportunities in poverty-stricken rural communities. StrikeForce was officially launched in 2010 as a pilot project in persistent poverty areas in rural Arkansas, Georgia and Mississippi. In 2012, StrikeForce efforts expanded into persistent poverty counties in Colorado, New Mexico and Nevada. In 2013, Secretary Vilsack announced new efforts to bring the StrikeForce for Rural Growth and Opportunity to Alabama, Alaska, Arizona, North Carolina, North Dakota, South Carolina, South Dakota, Texas, Utah and Virginia. In 2014, Strike Force efforts expanded into Kentucky, Louisiana, Tennessee, and West Virginia. There are now over 700 persistent poverty counties (PDF, 2.2MB), parishes, boroughs, Colonies and tribal reservations in twenty states receiving StrikeForce attention. Learn more about how StrikeForce is encouraging growth and creating opportunity (PDF, 270KB) |Spanish (PDF, 161KB), and how you can get involved. Baton Rouge, LA - Jason Matthews’ first foray into a foreign country was in 2003 when he had to withdraw as a student from Southern University to be deployed to Iraq where he was part of the U.S. military’s Operation Iraqi Freedom. 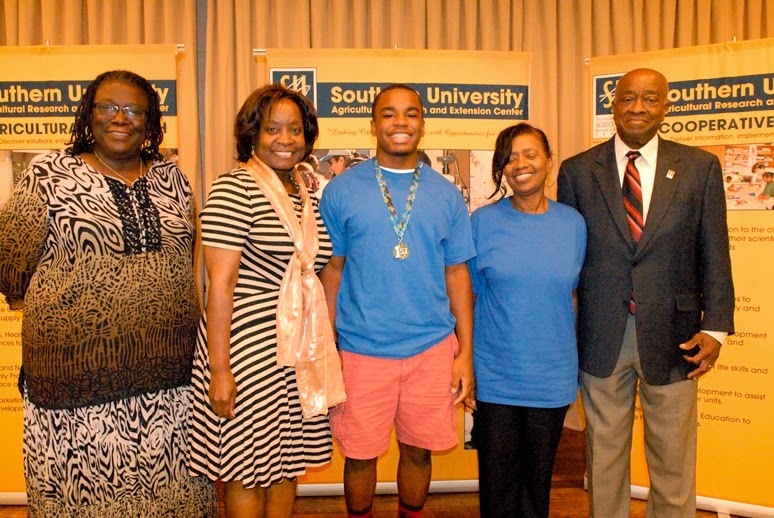 This time he is part of a 14-person group of Southern University students, faculty and alumni on a 9-day study abroad program. For Matthews and others, the trip to is a dream come true. The tour is designed to be a learning experience for students and faculty, said leader Dr. Shenika Jones, associate professor of criminal justice. The trip is a combination of efforts by the Dr. Carlos Thomas, head of the Division of Information Technology Office and the Department of criminal justice. They used Education First College Study Tours to facilitate the trip, which includes stops in London, Paris and Amsterdam. Alberta Robertson, an academic advisor to freshmen students, said the trip will provide her with clearer outlook on cultures that she can share with her students. This trip was a year in the planning and execution, with Dr. Jones also assuming a leadership role, Thomas said. Additionally, she said, “our participants will be afforded the opportunity to interact with travelers from California and Texas, as we will be joined by groups from Las Positas College (California) and Sam Houston State University. This will be the first of several such trips. Jones said planning is underway for 10-day excursion to Italy, Greece and the Hellenic Islands in 2015. For full details, contact Edward Pratt or Erin Fulbright, Southern University Media Relations at (225) 771-4545 or (225) 771-3907. 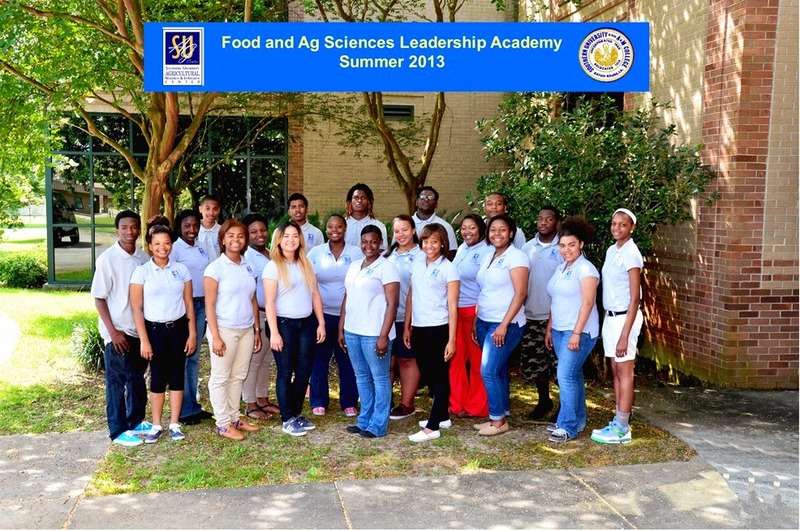 Baton Rouge, LA – The Southern University Agricultural Research and Extension Center received summer participants in The Academy for the Academic Enhancement of High School Students in the Food and Agricultural Sciences on June 1, 2014. The Ag Leadership Academy is a summer program consisting of two Phases. This summer, 20 students have returned to complete Phase II of the program under the direction of Zanetta Augustine, research associate and Dawn Mellion-Patin, Specialist, Agriculture. Phase II of the program comprises of an orientation for participants at the SU Ag Center in the first week, followed by hands-on work experience in a professional setting near their home for the remaining seven weeks. Students will be exposed to careers in Agriculture, Family and Consumer Sciences along with other professions. For more information, please call Zanetta Augustine at 225-771-2242. 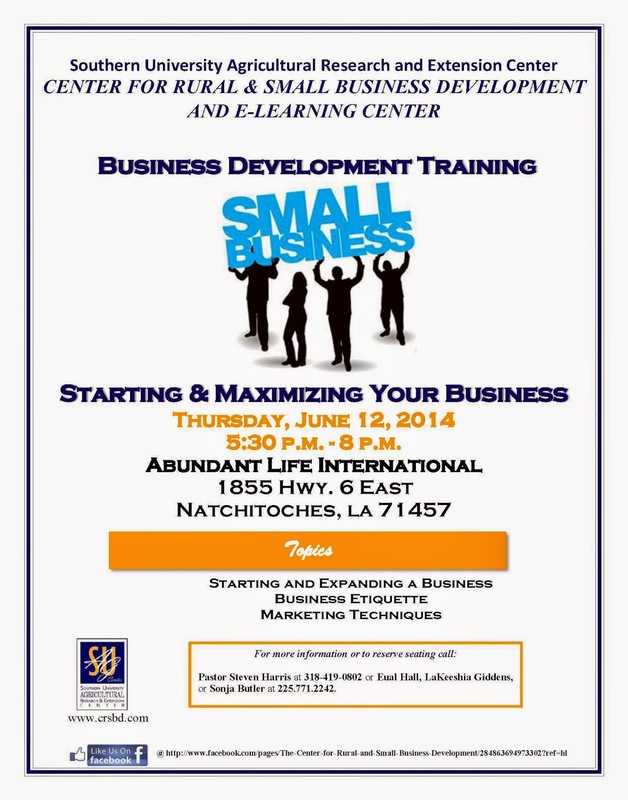 Baton Rouge, LA – The Center for Rural and Small Business Development at the Southern University Agricultural Research and Extension Center will hold a free business development training, entitled “Starting and Maximizing Your Business,” from 6 p.m. - 8 p.m. on Thursday, June 12, 2014 at Abundant Life International, 1855 Highway 6 East, Natchitoches, LA 71457. Registration will begin at 5:30 p.m.
To register, please call 318-419-0802 or to receive additional information about the training, contact Eual Hall, LaKeeshia Giddens or Sonja Butler at 225.771.2242. Baton Rouge, LA – The Southern University Agricultural Research and Extension Center, through its Second Chance 2 Recovery program brought inmates at East Baton Rouge Parish Prison and their families together to enjoy a relaxing day on June 3, 2014 as part of the prison's "One Day With Kids" event. "It's a very special feeling, I cherish the moment being with them and just spending time with them," Tameka Johnson said as she kissed her son on the cheek. Prison officials say the ladies earned the special extended visits by graduating Southern University Agriculture Center's "Second Chance 2 Recovery" program. The Second Chance 2 Recovery program, which teaches inmates job and parenting skills gave the inmates eight hours to visit with their children in a carnival setting, motivating them to do better when they return to society. It was fun for children and mothers to play and eat together, giving them a chance to reconnect and make memories they can hold on to forever.